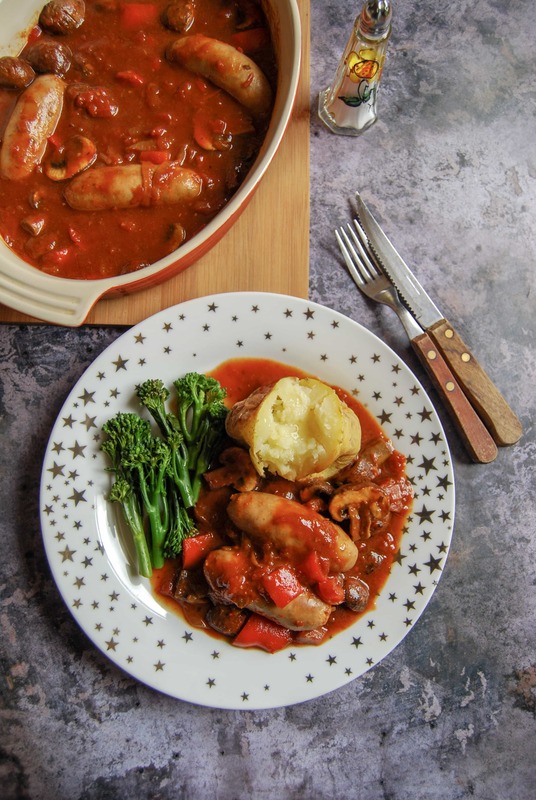 This easy sausage casserole is full of flavour and is simple enough to rustle up for a warming, hearty midweek dinner! 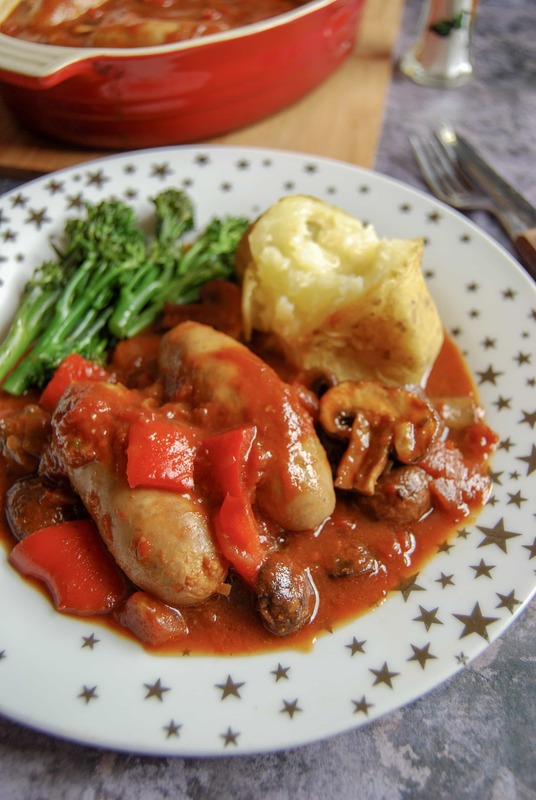 When the weather turns baltic and I want to feed my family food that will warm them from the inside and keep their tummies happy, there are a few fail-safe recipes I turn to again and again. 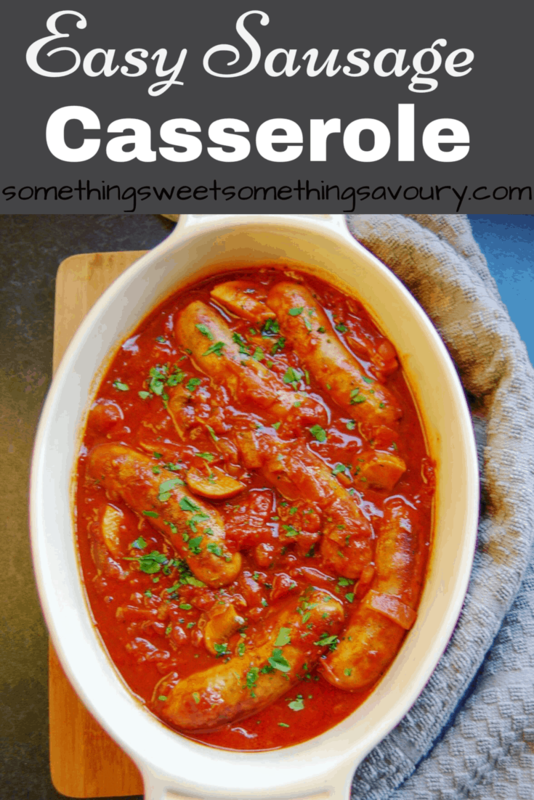 This easy sausage casserole is one of them. It’s hearty, filling and delicious. 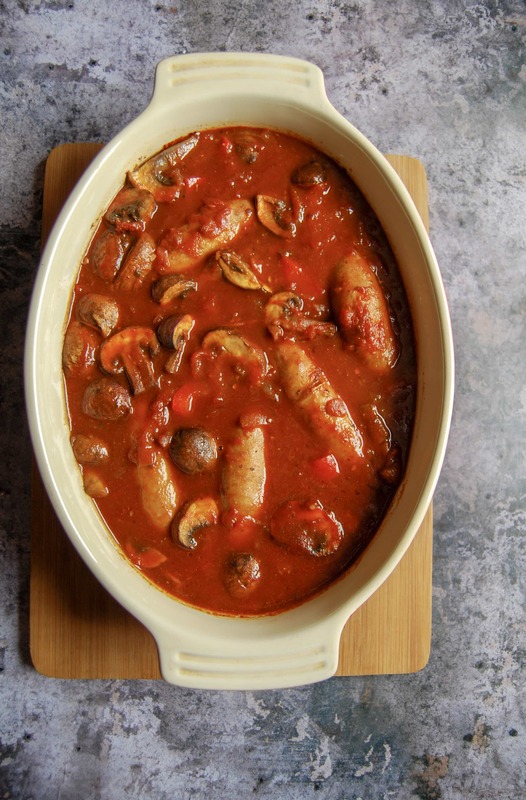 When I was a teenager, sausage casserole was one of my favourite dinners. 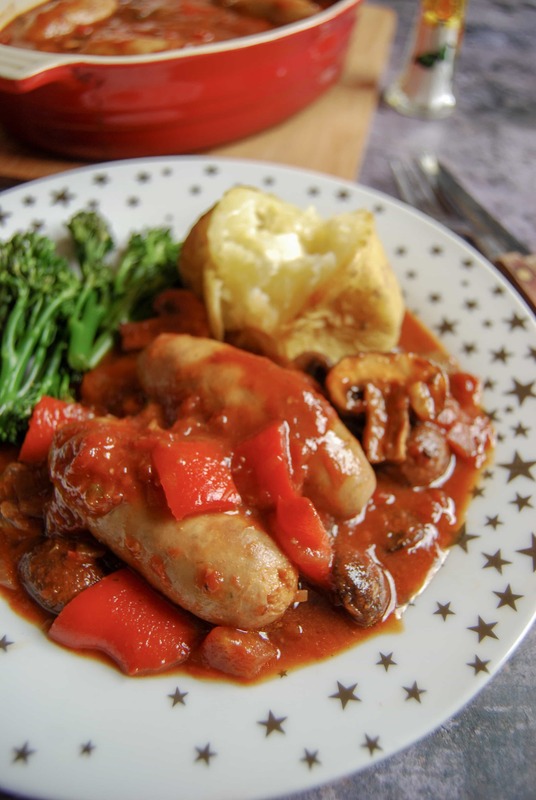 We used a Coleman’s sausage casserole mix that I’m pretty sure is still available to buy. This is my homemade version. Can I adapt the recipe by adding different veg? Sure! If you aren’t a fan of mushrooms, feel free to use this recipe as a blueprint and add any other veg you fancy – sweet potato chunks, butternut squash, a can of canellini beans – the list is endless! You could also add a few chilli flakes for a spicy hit. I don’t think you can beat a great big mound of buttery mashed potatoes to serve on the side, and some seasonal green veg. This post has been updated from 15th November 2014 – (4 years ago today!!) with new photographs and I’ve replaced the leek in the original recipe with onions and I’ve added chopped red pepper. If you would prefer to use leeks instead of onion, please go ahead. The recipe works just fine with either! My crusty tiger bread would be a fabulous accompaniment to mop up the juices. Preheat the oven to 200C/180Fan. Heat the oil in a large frying pan and gently fry the sausages. When they are brown, remove from the heat and set aside. Gently cook the onion for five minutes until softened. Add the garlic and cook for a further two minutes. Add the diced pepper and mushrooms and cook for a couple of minutes before pouring in the beef Stock, chopped tomatoes and smoked paprika. Transfer to a deep casserole dish and cook for 45-60 minutes, until bubbling and piping hot. Add seasoning and serve with mash, rice or baked potato. This would be great for the slow cooker Nic! Looks yummy. Growing up in the UK, one of my favorite foods was Sausage Casserole ~ made with a can of oxtail soup! I now live in the US with my vegetarian family and decided to give it a try using Tofurkey Italian sausages! I cut the ‘sausage’ up into small bite-size pieces and followed the rest of the recipe ~ and it was really GOOD! I’m so pleased you enjoyed the recipe, Helen! Thank you for giving it a try!